Today my toes are stuffed into warm wool slippers…it’s too cold to go barefoot! I kept looking down over and over to make sure I was really able to do it without leaning over. And I could! I am noticing that my abdomen is finally starting to flatten out some and that the belly bulge is finally starting to diminish. Every day when I look in the mirror, I notice more of the contours and angles that I was built with as they become uncovered by my weight loss. I’m getting more and more used to the body I’m starting to see I will likely end up with and slowly learning to like what I see. This is tough, because when you are accustomed to seeing yourself in the image of the Stay-Puft Marshmallow Man, seeing yourself as a normal-sized person is a real challenge. Reconciling your physical appearance with the appearance your mind’s eye chooses to see is a tough thing to learn, and it’s something I know I’m going to be working on for a long, long time. My surgeon has just released his first book, which I finished reading last night. If you are considering any kind of WLS, I recommend it. If you’ve already had WLS, I also recommend it. There is a great deal of really great information inside, but very little about the surgeries themselves. This book is more about the psychological issues one will encounter when a WLS patient, which I think are important ones to consider since these are things that are often not discussed in the information seminars most of us attended prior to having surgery. 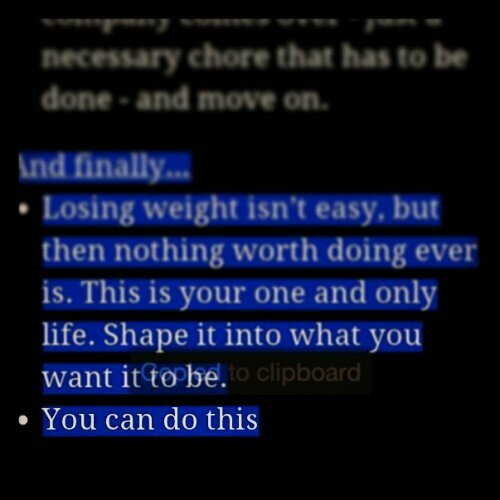 I can do this. I am doing it. And so far, I am successful. And I am working on making this part of my life all that I know it can be now. I have my doctor to thank for that. I will be sure to tell him that at my follow up appointment next month. Recipe time! I put together a soup today that turned out to be super tasty, and warmed both me and hubby up on this icy day. It’s full of vegetables and chicken, and low in fat. Put everything in a 6 quart slow cooker, and cook on high for 6 hours, stirring occasionally. Using My Fitness Pal, I calculated it for 12 1-cup servings with the following nutritional info: 11 g protein, 11 g carb (all from veggies/beans), 3 g fat, 3g fiber, 119 calories. I ate my serving with a half-ounce of part-skim shredded mozzarella and it was yummy! And finally…what I ate on this chilly day. Protein was high, at 92 grams, with 45 grams carbs and 35 grams of fat. Much better day today than yesterday. 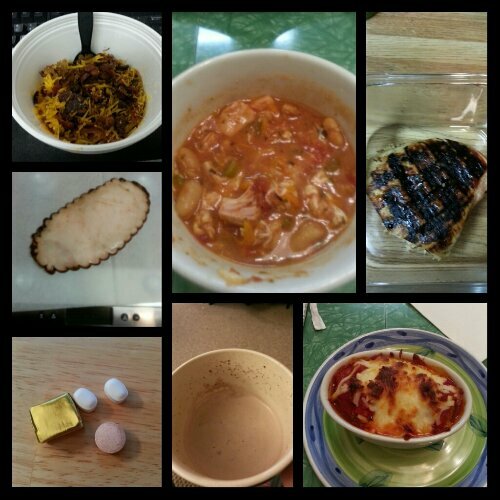 Today’s food choices, from upper right: grilled chicken breast with Rufus Teague touch o’ heat barbecue sauce (not shown); Trader Joe’s turkey meatballs in marinara with mozzarella; Swiss Miss diet hot cocoa; multivitamin and calcium supplements x2, iron supplement; Boars Head Honey Maple Glazed turkey slices; leftover Rudy’s breakfast bowl; Italian chicken vegetable soup with shredded mozzarella. 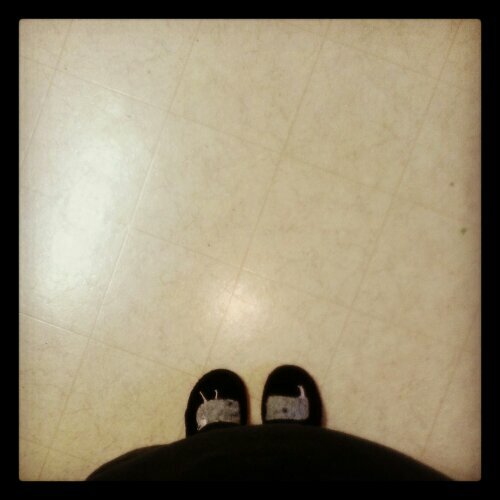 This entry was posted in celebrations, cooking, daily bites, eating, head trips, post-op, recipes, self-image, success, vsg, weight loss surgery and tagged benefits of wls, cooking, cooking is NOT hard, daily bites, dr. nicholson, eating, head trip, healthy eating, little celebrations, NSVs, post-op eating, post-op life, recipes, self-image, sleeve gastrectomy, things of win and awesome, VSG, vsg realness, what's up doc?, WLS, work that head game. Bookmark the permalink.